to me, an old knitted sweater has a multitude of meanings. and the lives of her family and community. 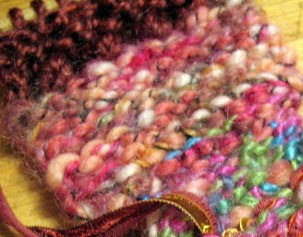 this is a bit of free form knitting that i started very late last night after a day spent with my mother. three and a half hours on the road. traffic jammed up going north. made for a long difficult day. so a small box of fiber scraps. like life. some silk. wool. mohair. and a few mysteries. some unknowns. all left-overs from other projects and a fine way to unfrazzle frayed nerves. relax. ahhhhhhh. i am making weekly trips to see my mother who seems is suddenly old. suddenly frail. always smiling when I arrive. these days are restorative for her. as for me. but differently. our days together enlarge her world which has become so much smaller through loss of vision and illness. these days re-focus my world. yesterday we were joined by kathy (my SIL), her daughter kim and evie the youngest and newest family member at just 7 months. my mother remarked that she had her oldest child (me) and her young great grandchild both visiting on the same day. Knitting is a distinct virtue. your mind can reflect upon life. Love what you are knitting. Knitting got me through a very difficult summer last year. Have you seen the movie Like Water For Chocolate? I love the scene where they take her away in the cart and her knitting trails along behind her and just keeps going and going. terrific image. i read the book but didn't see the movie. it's great therapy to knit without pattern - like life - it comes without a pattern. and like life 'it just keeps going and going'. thanks deb for the analogy. Your knitting is so very inspiring!! I love all the colors and textures here. I would love to try this. Knitting I find is so calming and when I find my mind going in circles I know it is time to pick up some hand work that is meditative and restorative. These times with your mother make miss mine. It wasn't too long ago that I was with her too in these same circumstances. Enjoy these days with her. working (or is it playing) without a pattern can be soothing, whether knitting, quilting, whatever. I've just returned from a visit with my mother who lives 400 miles away and so I know how difficult it is. I see her so rarely that each time I see her the difference is startling. I live on the Maine coast where I am blessed with the gift of time to do work that nourishes my soul. These days, I'm practicing slow. . .reading, thinking, looking. . . giving myself the gift of timelessness to listen, learn, watch and just breath. Thanks for taking the time to visit my blog. Notes & comments are welcomed and always appreciated. Memories . . . .
All content is © Pat Spiller. Please do not copy or take images or content without permission. Travel theme. Powered by Blogger.